This year for the first time, the Michael Sedgwick Award for the best book on British motoring written in the English language has been joined by the new Malcolm Jeal Award for the best article to appear in print in English. This fascinating exposition of the hitherto rarely recorded participation of Rolls-Royce motor cars in the Monte Carlo Rally was meticulously researched and eloquently written in the style that we have come to expect from Tom and Will’s work in such publications as The Roycean. 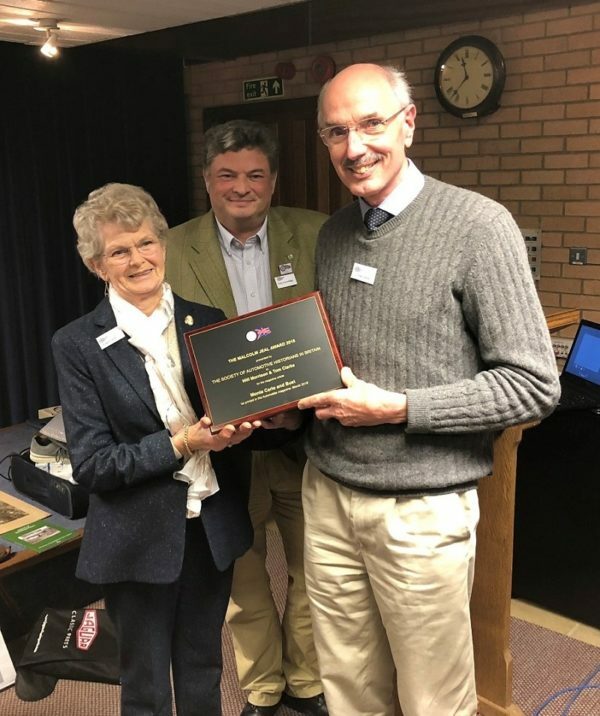 We were delighted that Malcolm’s widow, Eunice Jeal, was at our Autumn Seminar to present the award to Tom on behalf of the two authors (see our main picture). 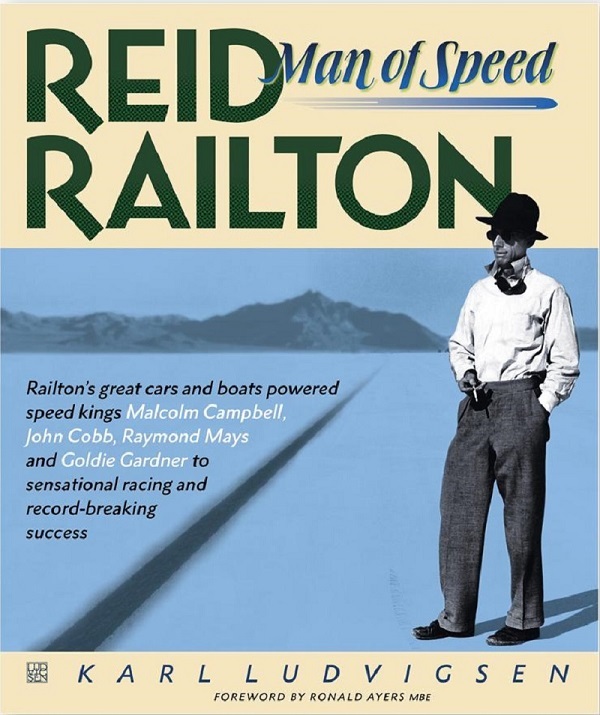 Railton’s life and achievements are the subject of this magisterial two-volume book, lavishly illustrated to a very high standard and with each of Railton’s activities put into the context of the time and comprehensively covered. 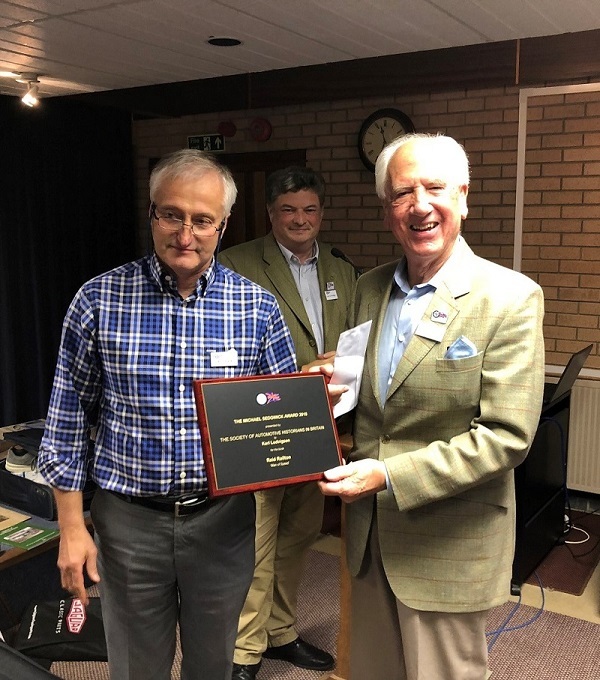 Member of the Judging Panel and Chairman of the Michael Sedgwick Trust, Peter Card, presented the award to Karl at the Autumn Seminar of the Society of Motoring Historians in Britain. Karl received a plaque and a cheque for £250. (See our photo below). The SAHB acknowledges the generous support of the Michael Sedgwick Memorial Trust in making this award. This book was recently reviewed in glowing terms by James Loveridge in the Book Reviews section on the left of this website – so we are especially pleased that Karl’s superb book has won the prize. Graham Rabagliati: From Send to Syracuse: the History of Connaught (Published by Douglas Loveridge Publications).